When organizations today seek to select and use technology effectively or to inform their decisions with high quality market research, they may rely on the services of Ventana Research located in Bend, Oregon. Founded in 2002, Ventana is known as a high value resource to companies seeking competitive advantage and enhanced performance. In 2005 Ventana assessed the functionality and performance of its corporate website, built on the original version of the Ektron Content Management System (CMS). It was determined that new architecture and a site redesign incorporating capabilities available in the latest version of Ektron would enhance the effectiveness of the site. At the same time, integration with Marketo, a leading enterprise marketing automation application was planned – a move to enhance the lead and revenue generation capabilities of the new site. With proven Ektron experience under its belt, a carefully thought out approach to the development project, and strong references, Innovare Technologies was awarded the contract to design and develop the new site – and migrate the data from 50,000 users from the old site to a new one in the process. Beginning in early 2011, a team of developers from Innovare’s San Jose, CA location began building in the new functionality enhancements to meet Ventana’s requirements, including the ability to create content using Ektron Smart Forms, post and view webinars, and create research pages. Efforts for this new site maximized capabilities in the latest version of Ektron, such as Collections, Taxonomy, Smart Forms and Widgets. Delivery of the new site and the integration with Marketo were well received by Ventana and users of the site alike. Positive references by Ventana CEO Mark Smith turned into new opportunities, such as Kewaunee Scientific. Today, Innovare remains in a long-term contract with Ventana, continuing to align the features and functionality of the Ventana site with the business and marketing objectives of the company. 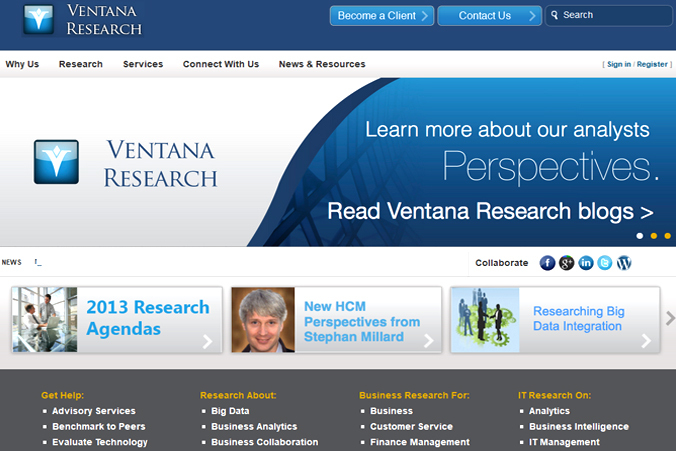 Learn more about Ventana Research. "Innovare provided our company the migration and upgrade of Ektron to establish our website and community at www.ventanaresearch.com. In addition to the migration Innovare successfully integrated Ektron into other external systems. Innovare was responsive and had the energy to complete the project but also provide the upgrades and improvements that we required while maintaining a live operational system."